A gravity shower allows the hot and cold water to flow and mix under gravity from the hot and cold water tanks to the shower head. The size of the pipes between the header tank and the shower head. 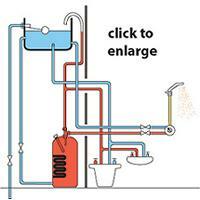 The length of the pipe runs between the cold water header tank and the shower head. Generally speaking, the higher the tank, the larger the pipes and the shorter the pipe runs, the better. If the water flow and pressure at the shower head are inadequate, the situation may be improved by raising the header tank or by converting to a Power Shower. If the cold water tank is raised, a very solid structure will need to be built to support the tank in the higher position - a tank full of water is VERY heavy. 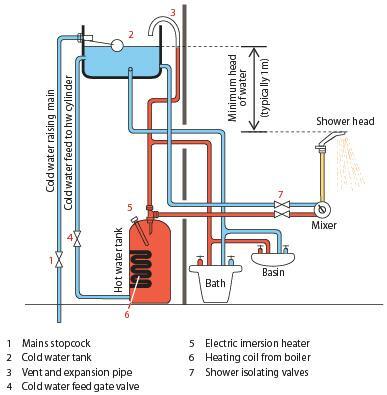 The size of hot water tank will determine how long the shower will run (unless you like cold showers), although the tank will be replenished from the header tank, the water will not be heated as quickly as it is used. The size of cold water tank needs to be sufficient to refill the hot water tank and also supply the cold water, although the tank will be replenished from the mains, this is unlikely to refill it as fast as the water is being drawn off. Typically a 220 litre (50 gallon) tank should be considered the minimum. Pipe work should be as short as possible, with as few bends as possible to minimise flow losses. Avoid taking the water supplies from any pipe work feeding other outlets, it is better to take the water feeds directly from the tanks. Future maintenance is eased if isolating valves are fitted in both feeds to the mixer, then if the shower mixer ever needs to be removed, it can be easily isolated.